Snow biking, otherwise known as ski biking or skibobing is the latest craze on the slopes. 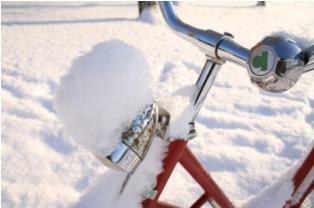 A snow bike, as its name implies, is a strange combination of a ski and a bicycle. They can be described as the reinvention of both the wheel and the ski. Snow biking may be new to the slopes, but it is not a new invention. Information on the ski biking website explains that oil paintings in the 1850s show wooden bikes, which were used in the European Alps as a form of winter transportation. Then, in 1892, an American by the name of J. C. Stevens created the "Ice Velocopide" which was a bicycle whose front wheel was replaced by a ski. Later, in 1939, MGM produced a short movie called Ski Birds, which featured a couple riding a metal ski bike. Engelbert Brenter, an Austrian ski manufacturer created the "Sit-Ski" in 1949. He replaced the bicycles runners with alpine skis and created a suspension system. These ski bikes were capable of making skidded turns on the snow. Brenter's family still manufactures snow bikes. The sport of snow biking became popular in Europe in the 50s, 60s and 70s. The Federation International de Skibob was founded in 1961, and the first snow biking World Championship was held in 1967. The sport was not as popular in the United States, but the Skibob Club of Santa Rosa was formed in California in 1965, and the American Skibob Association, a rival organization was founded in 1967 in Littleton, Colorado. The Colorado organization sponsored a snow biking clinic at Arapahoe Basin in February of 1968. Two days later, a competition was held at Aspen Highlands. Snow biking experienced a Renaissance in the 1990s. It is now offered at various North American ski resorts. While some North American ski areas now permit snow biking, some only allow limited access. Rules may vary. Some resorts have lessons; others do not. Be sure to check to see if the resort will allow you to bring your own bike. Most of the snow biking resorts are located in Colorado and California. This is a partial list, but keep in mind, as the sport gains popularity, this list may be subject to change. Arapahoe Basin:Arapahoe Basin offers open access to snow bikers. A leash is required for lift rides. Buttermilk and Snowmass: Buttermilk and Snowmass, part of the Aspen Ski Company, have restricted, limited access for snow biking. Copper Mountain: Copper Mountain has open access ski biking. Durango: Ski biking is permitted in Durango, but a permit is required. The resort offers ski biking lessons. Steamboat: Steamboat has open access ski biking, but snow bikes are not permitted in the terrain parks. Vail: A permit is required for ski biking in Vail. Lessons are offered. Winter Park: Winter Park has open access ski biking. Lessons are offered, but a permit is required for renting equipment. Bear Valley: Bear Valley has open access, but a bike leash may be required. Heavenly Mountain: Heavenly Mountain has ski biking lessons. Lake Tahoe: Both Northstar at Tahoe and Sierra at Tahoe have open access ski biking. Check the ski bike website for additional snow bike resorts. There are three basic types of ski bikes. Traditional bikes are designed to be used with foot skis. Hybrid bikes, also called "motobikes," are designed for use without foot skis. Board bikes use a snowboard foot platform instead of a pair of skis.